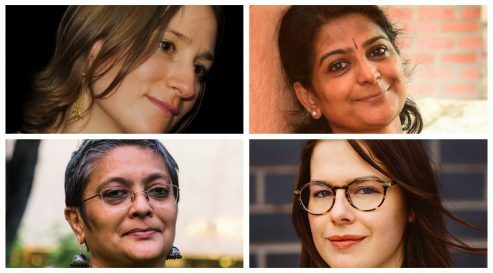 Ten poets from India and Wales will take part in a project organized by Literature Across Frontiers and partners to mark the 70th anniversary of India’s independence. The poets collaborate on translations and new work with cross-overs into other art-forms during a series of residencies in both countries, alternating between hustle and bustle of Indian metropolises and peace and quiet of Welsh towns and rural locations. The project will address the theme of “independence” in a series of creative encounters and exchanges which will have a ripple effect on the immediate environment in which the participating poets live and work. In artistic practice, independence means freedom to think, act and create beyond the confines of convention and economic necessity. But successful independence – of communities and individuals alike – also involves co-dependence, collaboration and understanding across divides and differences. At a time of global change which sees increasing friction between identities, we hope to open up a unique dialogue and formulate new narratives and ideas which both uncover and move beyond difficult histories. The project will explore the ongoing literary relations between India and Wales as developed through our work since 2009, harness its legacy, establish deeper collaborative relationships between poets from Wales and India, and facilitate new connections leading to future projects between the two countries. The poets will also work with other local writers and artists, and visit schools and colleges. The work produced during the residencies in 2017 will be showcased in a series of performances, readings and discussions in the 2018 winter literary festival season festival in India when a multilingual publication will be launched with work of the poets in Bengali, Kannada, Khasi, Malayalam, English and Welsh. The project kicks off in May 2017 with performances by the Bangalore-based poet and translator Mamta Sagar at the Wales International Poetry Festival in Aberystwyth, Caernaforn and Bangor, and will continue with the first two residencies – in Swansea and Bala – followed by an event at the Hay Festival where the India-Wales project will celebrate a literary “Mela” with Welsh poets Nia Davies, Sian Melangell Dafydd, Mamta Sagar and Keralan poet Anita Thampi. Siân Melangell Dafydd is an author, poet and translator. Her first published novel, Y Trydydd Peth (The Third Thing; Gomer, 2009) won her the coveted 2009 National Eisteddfod Literature Medal. She writes in both Welsh and English and often collaborates with artists of other disciplines. She was the co-editor of the literary review Taliesin and Y Neuadd online literary magazine for six years. Her second Welsh language novel and a collection of hybrid literature, Spitting Distance are forthcoming. She works with authors and poets internationally to translate literature between minority languages and is undertaking research in yoga and writing as parallel practices. She works as a lecturer in Creative Writing at the American University of Paris, France and course leader of the MRes in Transnational Writing at Bath Spa University, England. Mamta Sagar is a Kannada poet, playwright and translator living in Bengaluru. She has four collections of poems and plays. Kaada Navilina Hejje (footsteps of the wild peacock 1992), Nadiya Neerina Teva (dampness of the river water 1999), Hiige HaaLeya Maile HaaDu (like this on the page the song 2007), Hide & Seek, a collection of selected poems in English translated by Chitra Panikkar with the source text in Kannada (2014), Chukki Chukki Chandakki, a musical play for children (1993), The Swing of Desire, translation of her Kannada play ‘Mayye Bhaara Manave Bhaara’, included in Staging Resistance: Plays by Women in Translation (2004), Como esto en la pagina la cancion, a collection of her poems in Spanish translated by Nicolás Suescún and Nelson Roque Valdés (2008). She has translated and edited Beyond Barriers: Slovenian-Kannada Literature Interactions, a trilingual compilation of poems and stories (2011). Elif Shafak’s Forty Rules of Love is one of her recent translations into Kannada. Mamta has collaborated her poetry performance with visual artists, musicians and poets from other language areas within and outside India. Mamta is a recipient of the Charles Wallace India Trust fellowship (2015).